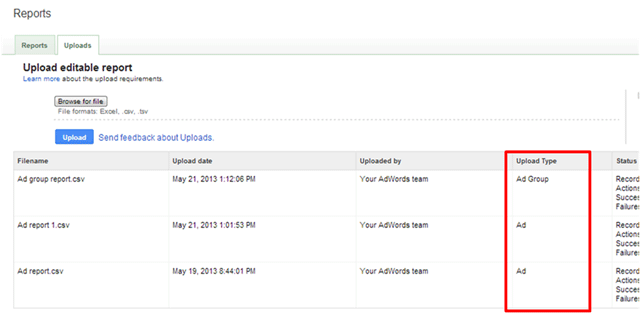 Google announced on the AdWords blog that they now support bulk uploads for ads and ad groups. Imagine you download a report from the Ads tab and want to test different creatives in ad groups that are underperforming. You might also want to turn off certain ad groups, or change the budget for others. Instead of toggling back and forth between AdWords and your spreadsheets, you can now download reports from the Ads and Ad Groups tabs, make changes directly in your spreadsheet, and upload them directly to your account. Then make your changes and save your changes in the format of CSV, TSV or Excel. Then you can upload these changes by clicking on “Reports and uploads” on the left navigation panel, and then select the “Uploads” tab. You will see a new column here titled “Upload type,” shown below. For more details on this, see the help document. Previous story: Blekko Dazzles Search Results Design But Does That Improve Relevancy?